The granola market appears to be saturated with dozens of types of granola and, yet there’s always room for one or two more by Purely Elizabeth – a Boulder-based food company that makes the most popular granolas in the natural food market. 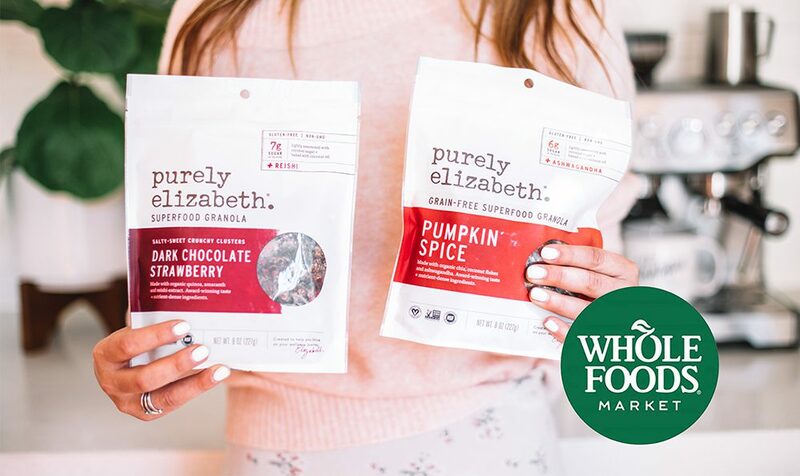 A label consumers can always trust, Purely Elizabeth recently introduced two Grain Free Superfood Granolas that are available only through Whole Foods Markets. 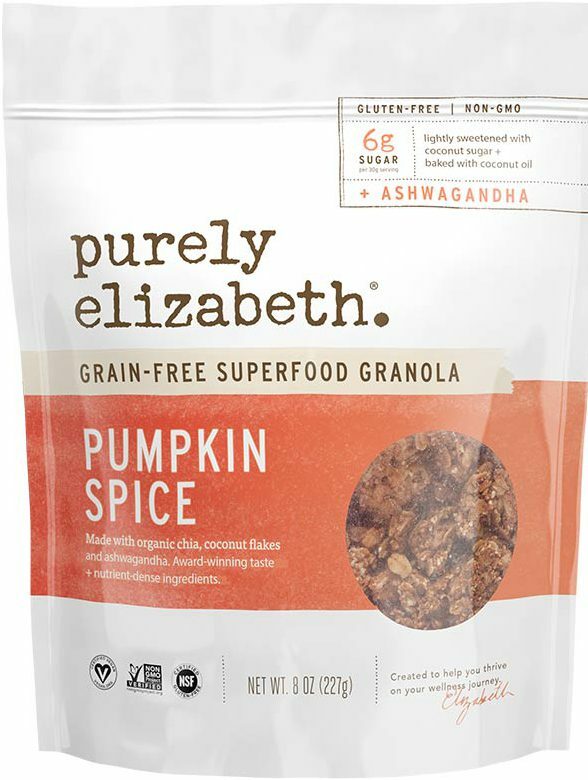 Pumpkin Spice Grain-Free Superfood Granola is made with organic pumpkin seeds, organic sunflower seeds, organic coconut sugar, organic coconut oil, organic coconut flakes, almond meal, organic chia seeds, cashew butter, cinnamon, vanilla extract, sea salt, organic abhwagandha (an ancient herb in Indian Ayurvedic medicine that has many benefits including several studies that show it reduces blood sugar and cortisol levels, and more), nutmeg, cloves, and ginger. This granola is chewy, crunchy and not too sweet which makes it the ideal morning breakfast with non-dairy milk. Or, sprinkle on top of your favorite yogurt or smoothie for an added crunch and boost of flavor. The cinnamon, nutmeg, cloves and ginger shine in this granola. Serve always but especially in the Autumn around Halloween and Thanksgiving. Dark Chocolate Strawberry Grain-Free Superfood Granola is made with organic gluten-free oats, organic coconut sugar, organic coconut oil, sunflower seeds, organic fair-trade dark chocolate chunks (organic cane sugar, organic chocolate liquor, organic cocoa butter, organic vanilla extract), freeze-dried strawberries, organic quinoa flake, cocoa powder, organic amaranth puffs, chia seeds, cinnamon, sea salt, organic reishi extract (a natural extract made from reishi mushrooms which is reported to help the immune system). Although granola is a breakfast favorite, Dark Chocolate Strawberry Grain-Free Superfood Granola can also be enjoyed as a snack right out of the bag. When a craving for a cookie comes along, enjoy a piece of this granola. 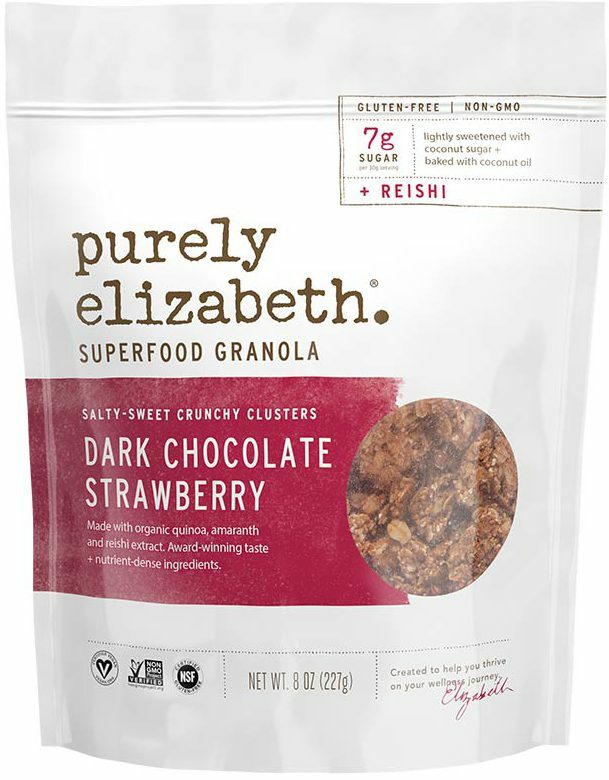 Not too sweet with a strawberry chocolate flavor, this granola reminded me of a crunchier version of the Purely Elizabeth Wellness Bar Strawberry Dark Chocolate with Almond Butter (a test market product that came out in March, 2017 and that I still pine for). There’s just something irresistible about dark chocolate and strawberries. The Grain-Free Superfood Granolas are sold in resealable 8 ounce packets for about $7 per bag. Find in the cereal aisle in Whole Foods Markets.